One of the many ways that the marine industry utilizes custom aluminum extrusion is in the design and manufacture of docks, marinas, and other marine access solutions. Aluminum boat docks are designed to last much longer than traditional wood materials, providing slip-proof, corrosion-resistant aluminum products for industry that are sustainable and perfect for such a harsh working environment. Used by individual boat owners and professionals alike, docking systems are created to provide long-lasting, high-performance for each situation. Like other types of industrial projects, the use of custom aluminum extrusion helps the manufacturer to save both time and money. By designing each piece of the aluminum boat docks and other marine access solutions to fit perfectly together for easy assembly and to enhance the quality of the finished product, our clients are able to create a cost-effective solution for their customers. There are many other benefits associated with choosing aluminum extrusion. Silver City Aluminum works with each client to help them maximize those benefits to their advantage. Did you know that aluminum boat docks and other custom aluminum products for industry are used frequently in high traffic areas? Commercial dock and pier systems, busy marinas and boat launches, popular theme parks and other public venues, all rely on products made with custom aluminum extrusion. Individual consumers, private companies, commercial organizations, and even government entities have used aluminum marine access solutions to provide safe and effective options for heavy-duty, high traffic areas. Quality aluminum extrusion offers many unique opportunities for manufacturers and their customers that they just can’t expect from other materials. By designing their own custom aluminum extrusion profiles, our client manufacturers are able to offer their customers the unique opportunity of creating custom aluminum boat docks and marine access solutions. There are many situations where an “out of the box” type dock or access product just won’t work, so it pays for manufacturers to have the flexibility that comes with designing custom aluminum products for industry. Our clients can choose various options and elements for design, based on the unique needs and requirements of each customer, providing systems and products that are best suited to the location, application, and use of the finished solution. At Silver City Aluminum, we handle a variety of decking orders, including aluminum docks and decks for our residential and commercial customers. We can extrude custom docking systems and even create custom aluminum residential decking, based on the demands and needs of our customers. We have many years of experience working with marine industry solutions, including the design and manufacture of aluminum boat rails and even sailboat applications, structural materials, and other specialty designs. We work closely with each of our marine customers to ensure that all of their specifications are met. We offer a variety of secondary finishings that work to further protect the completed marine access solutions and other aluminum products for industry. However, these finishings can also create an aesthetic or functional appeal for the end user. Painting, powder-coating, and anodizing are just some of the processes available at Silver City Aluminum. We work with several different powder coaters and anodizers to provide our clients with a finish that provides the aesthetic look and texture that they desire. We do all of our finishing solutions in-house to improve lead time and quality for every single project we undertake at our Southeastern Massachusetts facility. 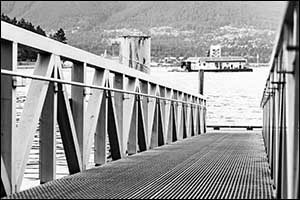 Compared to other materials commonly used for marine access solutions, including concrete, steel, and wood, aluminum products for industry as far superior. Aluminum won’t crack like concrete materials, and it does not like rot like wood. When considering other metals, aluminum is lighter in weight than steel, yet just as strong. Aluminum is also naturally resistant to corrosion and is a sustainable material that is very affordable, providing a solid return on investment for everything from aluminum boat docks, marinas, piers, and other marine industry solutions. Custom aluminum extrusion allows designers and manufacturers to eliminate and reduce many of the common issues seen with standard design elements, further enhancing the unique qualities of the aluminum material to extend the life of the products. Aluminum is also extremely friendly to the environment, with most extrusion made from 99.9 percent recyclable aluminum billets, the finished product is also 100 percent recyclable, reducing the impact on local landfills. Aluminum has become a real asset to the marine industry, and Silver City Aluminum has many years of experience working with these types of products and solutions. To learn more about our services or to speak with an engineer or technician, give us a call at 508-824-8631.